Apprentice Teo Nugent has been rewarded for his hard work with a Caulfield win on Think Bleue. Apprentice Teo Nugent’s first race ride on his home track has been successful aboard the well-backed favourite Think Bleue at Caulfield. Prepared by training partners Ciaron Maher and David Eustace, Think Bleue took out Saturday’s Polytrack Handicap after being backed from $3.60 to $3. “It’s lovely to get one at home especially as I do so much trackwork here and its great to ride one for the boss,” Nugent said. Since the disqualification of Darren Weir and Maher Racing taking over the Ballarat stables of the disgraced trainer in February, Nugent has been racking up the miles. 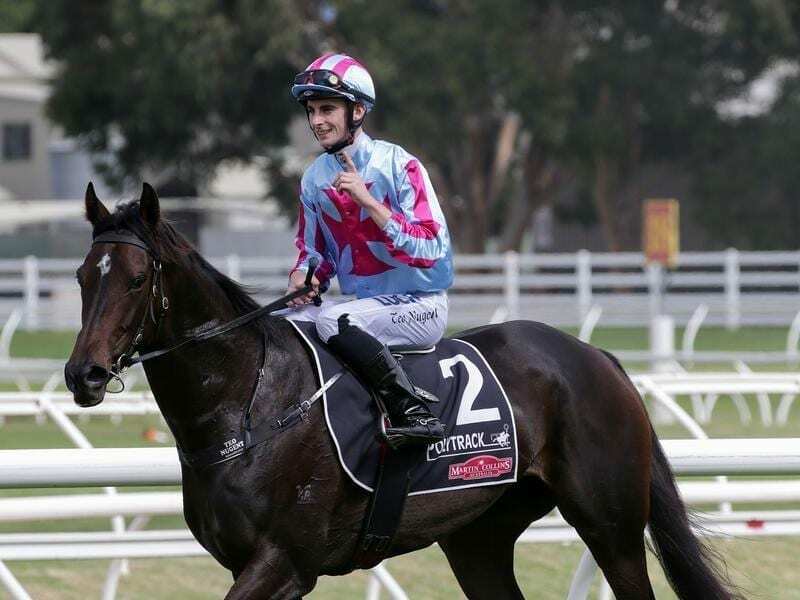 “I’m out of bed at 3.30 of a morning, at the track here (Caulfield) at four, ride a couple and then head off to finish off the morning at Ballarat,” Nugent said. “Luckily I didn’t have to do that this morning, but the past week has been flat out and then there’s racing on top of that. Saturday’s victory was Nugent’s third in the metropolitan area and comes after outriding his country claim. “The background work I did over in Ireland has really helped me and outriding my claim in the country before coming to town has also been beneficial,” he said.